Discussion in 'Android Questions' started by dcoun, Jul 13, 2018. 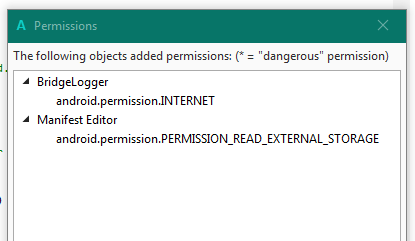 I have an activity and I want to have the "PERMISSION_READ_EXTERNAL_STORAGE" or any other dangerous permission just after activity loading, before user starts interaction with the activity. When I compile it as Debug, it runs, it shows the dialog requesting the permission. When I complie it as Release, it runs, and enters in an endeless loop without shown the dialog requesting the permission. When I put the above code in Activity_create there is not an endless loop in release mode but the result is false without showing the dialog requesting permission to the user. It just return false. In debug mode, it works ok.
My main problem is that the dialog requesting the permision is not shown in the release mode. I have to add that, the application in Settings has not a past answer kept denying the permission. Having an activity that starts and based on the Intent probably we need to request a dangerous permission. In such a case, the need starts inside the Activity_resume. b) From activity_resume, if needed, call with callsubdelayed a second sub to request the permission, after activity_resume is finished and activity is shown. Based on the result of the checkandrequest continue the algorithm through this sub. You have been trying to solve the run time permissions for a couple of days. Some very capable members have offered you solutions, but you insist it is a B4A bug. I think your best bet is to Export your entire project as: File, Export as zip from the IDE instead of posting scattered code snippets that are not easy to follow. You need to find a way to create a small project to upload. Peter Simpson and Johan Schoeman like this. The above is the first case: checkandrequest inside the activity_create. I did a copy-paste in a new project and it works. The second case is the checkandrequest inside activity_resume. Can you please tell me if the above dokimi.zip runs in release mode showing the dialog requesting the permission? In my IDE and devices, it does not. And it is more or less the same code. I change all the activity_create sub and run it in release mode. Can somebody explain me why, please? the problem is that when B4A believes the permission is not needed, it does not present the dialog, and it returns false. You are wrong. Too bad you haven't carefully watched the runtime video tutorial and instead made 20 posts. You can immediately see that there is no dangerous permission listed. So it will never show any dialog. I apologize for my mistakes and my posts. The initial problem was not the exact type of the permission. You have right, you have again right and again right but I did it in the process of having a project that replicates the problem and can be published. To be also honest also, I lived all this because I tested a sub compiled as release and I noticed that an other unfinished sub did not show the permission as it did in debug mode. I can confirm that debug and release mode act differently for requesting permissions. In everything else you have right. You have again right. no diffrence between debug and release. There is indeed one difference in debug mode and it helped to add to this confusion. The debugger does add the WRITE_EXTERNAL_STORAGE permission. So your code worked in debug mode as WRITE_EXTERNAL_STORAGE covers the READ_EXTERNAL_STORAGE permission. I'm pretty sure that this permission is no longer needed for the debugger and it will be removed. Peter Simpson and dcoun like this. Is it dangerous or not? Is it possible to have the Runtimepermissions.checkandrequest to return true (instead of false) when B4A or android believes that the requested permission is not needed to shown to the user to accept it? Read post #10. Read it as many times as you need until you understand your mistake. Please don't make any other posts until you understand. dcoun and DonManfred like this. kisoft, Mahares and dcoun like this.